Provides facts to help consumers evaluate and purchase gemstones, jewelry, watches and related accessories. A nonprofit organization that offers gemstone identification and buying advice to consumers and training to those in the jewelry trade. The GIA provides lab services to the jewelry industry. Jewelry store that offers educational articles to give consumers the facts about the products they sell. Library of articles about diamonds, pearls, and opals. 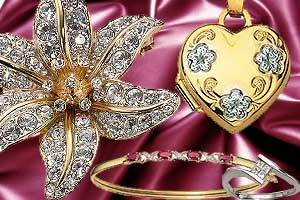 A collection of advice about buying many types of fine jewelry. Photos of gemstones, each accompanied by a description of the gems properties and where it is commonly found. Includes instructions for close-up gem photography. Jewelry history features take readers through the popular styles during specific eras. Also includes gemstone lore and articles about materials used to make jewelry. Diamond buying guide includes a price database, diamonds tutorial, and diamond FAQ.